This is our brand new 3 tier wooden folding flower racks which is very sturdy because of the durable natural wood construction. The elegant and beautiful appearance complements most existing plant. It is exactly the right combination for your garden pot. What's more, this 3 tier flower rack not only is a flower rack, you also can do as a bookshelf, display stand, decorative stand, etc. This folding design flower racks is easy to move or storage . It can be placed your favorite potted plants or your shoes, handbags and other items. Perfect for any place, balcony, living room, outdoor and so on. This beautiful flower rack will decorate your home, deck, or patio. Don't hesitate to buy it now ! 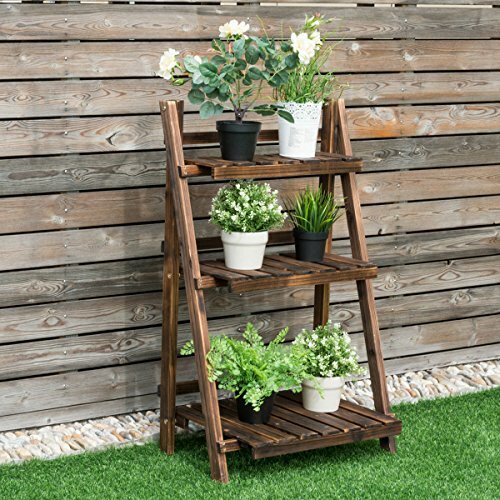 This decorative ladder plant stand allows you to store plants together vertically, making it ideal for small spaces. With three levels of wooden shelving, you get plenty of space to decorate with plants inside or outside of the home, adding a touch of rustic elegance to any room. The slatted bottom that each shelf has allows for proper water drainage ensuring that your plants thrive in their new environment. Features solid fir wood construction, gives the stand lasting durability and strength to ensure that it lasts indoors or out. ❃【Giantex 3 Tier Folding Flower Racks】: Our 3 tier wooden folding flower racks which is very sturdy because of the durable natural wood construction. Perfect for any place, balcony, living room, outdoor and so on. ❃【Beautiful Design】: The elegant and beautiful appearance complements most existing plant. It is exactly the right combination for your garden pot. ❃【Folding Design】: This folding design flower racks is easy to move or storage . It can be placed your favorite potted plants or your shoes, handbags and other items. ❃【Convenient Use】: With three levels of wooden shelving, you get plenty of space to decorate with plants inside or outside of the home, adding a touch of rustic elegance to any room. ❃【Sturdy Construction】: Features solid fir wood construction, gives the stand lasting durability and strength to ensure that it lasts indoors or out.